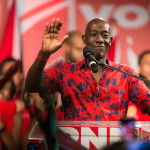 The Trinidad and Tobago government has condemned Opposition Leader Kamla Persad-Bissessar for a “racist attack” on Prime Minister Dr Keith Rowley, after she referred to the prime minister as an “oreo” during a public event on Monday. 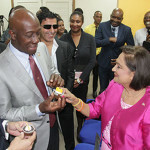 Persad-Bissessar made the remark while suggesting that Rowley was owned and controlled by the “one per cent” of Trinidad and Tobago. An oreo is a chocolate biscuit with a white cream filling; and, informally, is meant to suggest a black person who wants to be part of the white establishment. The release was issued by the Ministry of Communications, which is headed by Stuart Young. 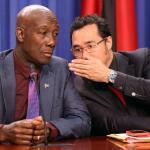 He also previously suggested that persons within his own party felt he was dark to be PNM leader or prime minister. 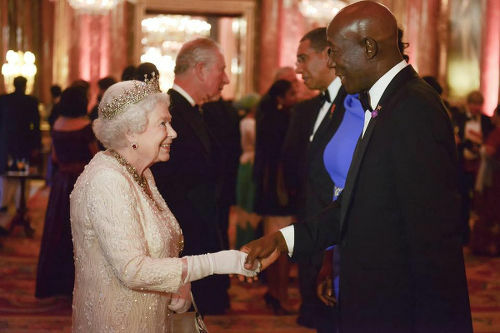 Photo: Queen Elizabeth II (left) greets Prime Minister Dr Keith Rowley (right) in April 2018. 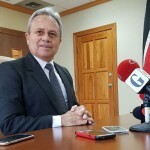 Whilst this Government has been guiding and leading the country in a stable, inclusive and productive way, through a number of difficult and demanding situations, including, the financial contagion effects created by Petrotrin, Mrs Kamla Persad-Bissessar and the United National Congress (UNC) have once again attempted to destabilise the country by consciously and intentionally utilising race to divide and destroy Trinidad and Tobago. This continued naked racial and divisive behaviour by Mrs Persad-Bissessar is hereby condemned in the strongest manner. This Government will not condone the use of race or class to attack any citizen of Trinidad and Tobago and we reject the continued disdainful and backward politics of the Opposition being led by Mrs Kamla Persad-Bissessar and her attempts to stir up racial tension in the country. 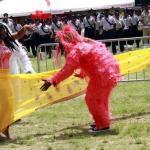 May every creed and race continue to find an equal place in Trinidad and Tobago. 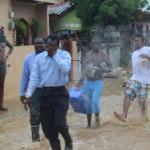 During my development in Trinidad and Tobago I have never been confronted with race. I attended a Catholic school in port-of spain and mingled with the likes of Joe de-Silva and Micheal Haddie sons and not anytime I ever heard or call the word or color. To me it’s always been a class thing which was brought by the indentedfrom India. First, second, and third class citizens. It’s a culture that innate in some of the descendants of the past indented. And, we understood that but, to be call or define the hue was not heard. There are some segment of our society where the level of servitude in neighborhoods and community’s – sharpening knife and scissors, bottles, ice ice, and even our modern day doubles merchants are soon becoming livelihood of the past. They have escalated to first class or the popular phrase, “we time”, where we all can, in whatever class or position of high office, say or do whatever to divided. We do hope that all who can hear the message of our President last speech of unity and bipartisan politics, which she suggest will only bring the country together and not divide it. She went on to say that parties can have their differences because it’s normal. But, their some issues that both can agree and work on for the benefits of the country and it’s people. In this country position and climate of things we need not only great thinkers but also women of substance. More to come.